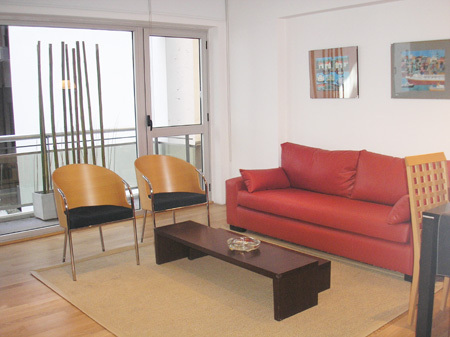 Beautiful and comfortable Studio located in an elegant building and in a great area of BA close to everything. It is located at the front part of the building . This Studio is very bright and it is tastefully decorated, the living area offer a comfortable sofa, a table with 3 chairs and access to a balcony. It has an open kitchen to the living-dinning area. The bedroom area has a queen size bed. The bathroom is complete and fully equipped kitchen. Pisos de madera, aire acondicionado, calefacción, TV por cable, una cocina de gas, horno, microndas, cafetera, Tostadora, utensilios de cocina, vajilla, plancha. Sabanas y toallas. Very good building, 5 year old. Pool for summer season. Laundry . Elevators . Downtown, Train Station, Subway, Bus Station, Bus Stop, Gym, University, College, Museum, Church, Historical Place, Art Gallery, Theatre, Cinema, Restaurants,Pubs, Shopping Mall, Cultural Center, Park, Square, Commercial Area, Pedestrian Street, CyberCafe, Bank, Exchange House.